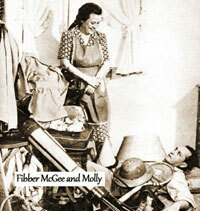 Here we bring you Fibber McGee and Molly, which was was an American radio comedy series that maintained its popularity over decades. The stars of the show are real-life husband and wife team James "Jim" Jordan and Marian Driscoll. Throckmorton P. Gildersleeve - the stuck-up next-door neighbor that liked to argue with Fibber McGee. The Old-Timer - A senior citizen that couldn't hear very well and liked to change jokes "That ain't the way I heer'd it!" Mayor LaTrivia - The mayor of Wistful Vista, whose name was inspired by New York's famous mayor Fiorello La Guardia. Billy Mills - leader of the Billy Mills Orchestra who conducted the band in each episode. Herbert Apple - A stock boy at the local hardware store who frequently misheard and misinterpreted what Fibber was saying. The show would usually open the 30-minute broadcast with the audience in full laughter with Harlow Wilcox announcing, "The Johnson Wax Program with Fibber McGee and Molly!" For most of the show's history, the usual order of the show is the introduction followed by a Johnson Wax plug by Harlow then his introduction to the script. Billy Mills usually follows with an instrumental. That musical interlude leads to the next section of the script, followed by a performance by the vocal group The Kings Men. The final act then follows, with the last line usually showing the lesson learned that day, a final commercial, and then Billy Mills' theme song as the ending of the show. 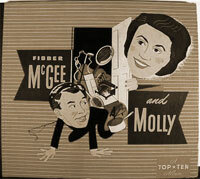 Now let's hear some Fibber McGee and Molly ! McGees Try To Go To Bed Early.